All of us will experience grief in our lives and in SEVEN CHOICES, the reader is guided through the often-confusing range of emotions and issues that occur during the grieving process. 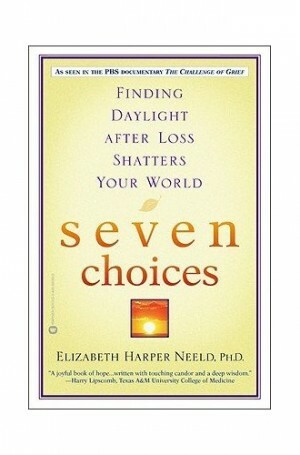 She author identifies the 7 major phases of grief, each of which offers the griever a choice that will engender growth and allow them to break with the past and experience the discovery of a stronger and balanced self. IMPACT, SECOND CRISIS, OBSERVATION, THE TURN, RECONSTRUCTION, WORKING THROUGH and INTEGRATION. Elizabeth Neeld lost her own young husband 10 yrs ago and her own journey through grief is poignantly told, as are the stories of others who have have coped with loss, helping readers understand that they are not alone in their chaos and confusion. Her familiarity with the scientific literature gives the reader invaluable information on how our choices and behavior determine our progress. Enriched by the experiences of people who have found a renewed zest for life, this beautifully written book provides the deep compassion, the keen insight, and the practical steps that will empower the bereaved person to become a healthier, happier and wise individual.